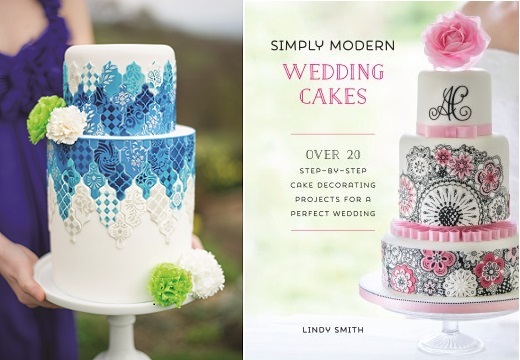 Vibrant colours and contemporary designs are the hallmark of Lindy Smith’s cake decorating and her brand new book, Simply Modern Wedding Cakes, is jam packed full of inspiration for the cake decorator. 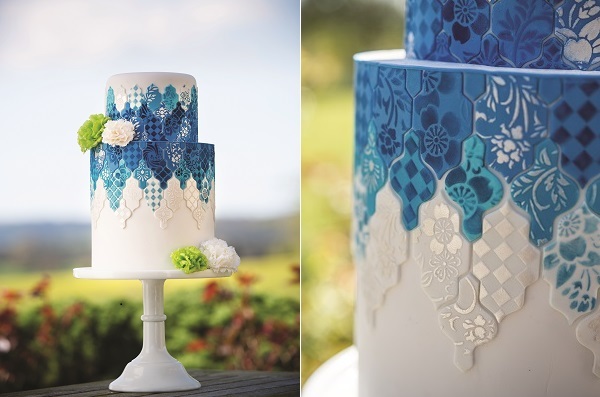 This week, Lindy shares with us an excerpt from her book – the stunning “Something Blue” tiled wedding cake tutorial. Lindy describes the inspiration behind this stylish new design: “Something old, something new, something borrowed… and this stylish cake is the perfect something blue! Tiled patterns and designs are fascinating in the way that they add interest and colour to often quite neutral spaces. “This cake was partly inspired by a visit to the Royal Alcazar of Seville; a magnificent palace richly adorned with beautifully shaped tiles in fabulous patterns and colours. “Here, a blue colour palette gives a cool, yet sophisticated look to this contemporary wedding cake but this, of course, can easily be adapted to suit. The patterns on the tiles themselves may look intricate, but they are created quickly and easily using stencils. “The blue and white tiles are the focal point of this elegant design. I have used a range of stencils to emboss the patterned modelling paste tiles, then dusted over the little flowers and geometric patterns with food colour dusts to make them pop. “I used two of my Moroccan tile sets to cut out slightly different-sized tiles for each tier, then attached the tiles in neat rows around the cake, mixing up the colours to add interest to the design. 1.7kg (3lb 12oz) white sugarpaste/rolled fondant. Place the top tier on the 12.5cm (5in) round hardboard, then cover this cake with white sugarpaste creating nice rounded edges and set aside. Place the main cake on the 17.5cm (7in) round hardboard. This tier will have a sharp edged finish – cover the top first with a circle of sugarpaste followed by the sides with a separate strip/panel of sugarpaste, then set aside to dry. Once the sugarpaste has set, dowel the base tier. Securely place the top tier in position, checking that it is central and the cake is level. 1. 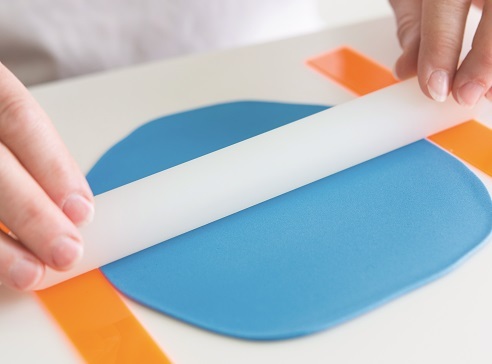 Knead the deep blue modelling paste until it becomes warm and stretchy, then roll some of the paste out onto your work surface between 1mm (1⁄32in) spacers. 2. Place the cherry blossom stencil on top of the modelling paste. Firmly press a smoother onto the stencil to force the modelling paste beneath it up to the top. 3. Tip some of each of the dust food colours into a paint palette. Dip a paintbrush into one of the blue dusts, knock off any excess and carefully dust over some of the flowers and leaves of the stencil, varying the intensity of colour by adding more or less dust. 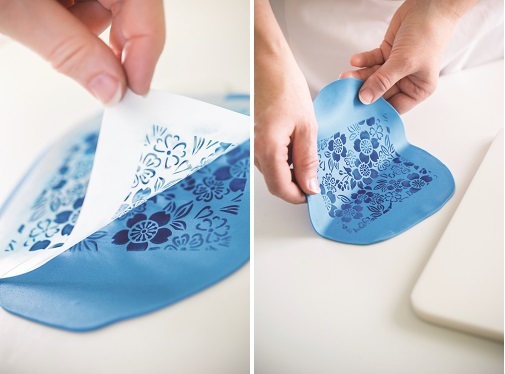 Dip a clean paintbrush into the second blue dust and carefully apply to the remaining flowers and leaves. Blend the second dust colour into the first by overdusting as desired. 4. Once you are happy with the effect, use a dry paintbrush to remove any excess dust from the stencil. This will prevent stray dust from falling as you lift it, spoiling the pattern beneath. Carefully lift the stencil away from the paste to reveal the pattern beneath. 5. 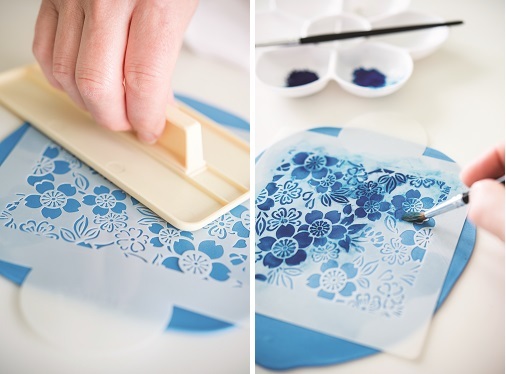 Carefully lift the stenciled paste from your work surface and place it on another board or portable mat. This has a dual purpose: first, it will make lifting your cut-out tiles easier and secondly, it will declutter your work surface, enabling you to easily make a selection of different tiles. 6. 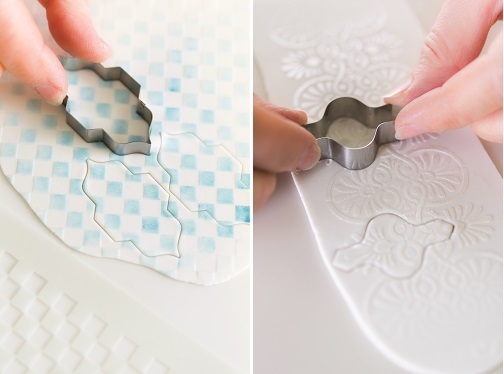 Once transferred, use the largest cutter from the large Moroccan tile set to cut out a selection of tiles, positioning the cutter to make the pattern on each tile look attractive. Cut as many tiles as you can before removing the excess paste. 2. Using a paintbrush, smear a thin layer of white vegetable fat (shortening) over the paste pattern showing through the stencil. 3. Dip a large soft dusting brush into the edible lustre dust, knocking off any excess. 4. Liberally dust over the stencil, adding more dust as necessary, then use your brush to remove any excess dust from the stencil. Once all the excess is removed, use the brush to burnish the dust to make it really shine. Note: burnishing is not possible with all makes of dust food colour. 5. Carefully lift the stencil away from the paste to reveal the pattern. Lift the patterned paste, reposition it onto another board and then cut out the tiles, choosing the positioning of the cutter carefully. Repeat Steps 1–4 using the cherry blossom stencil. 1. While the tiles are still on their boards, select nineteen tiles in a mixture of patterns. Then take a craft knife and cut away the tops of these tiles, as shown. Note: the remaining tiles will be used for the top tier. 2. Once the tiles are firm enough to be handled without distorting, carefully attach them individually around the top rim of the base tier using sugar glue, alternating the patterns and leaving a 1mm (1⁄32in) gap between each tile (above). 3. Working around the cake, place a 1mm (1⁄32in) spacer between each tile to check the positioning. 4. Roll out the deep blue paste, again between 1mm (1⁄32in) spacers. Cut out ten of the second tile shape from the largest Moroccan tile set. Take a craft knife and cut across each end of the tile, as shown. 5. Leaving the two cut end sections on your work surface, remove all the excess paste and allow the shapes to firm up. Once they can be easily handled without distorting, attach them in the gaps between the tiles on the upper edge of the cake. Check that the tile pieces are positioned centrally in the spaces and, if necessary, cut away their tops so they sit flush against the top edge of the cake. 1. Using the medium tile set, first cut tiles from inside the leftover large tiles – there is no point in wasting these! Then create any more you may need. The top tier has over two rows of deep blue tiles: one of each shape, plus part of the small tile. Each row comprises 17 tiles. 2. Start by attaching the largest tiles in place with sugar glue, checking their vertical position with a set square and 1mm (1⁄32in) spacer. Next add the smaller tiles in a row above. To fill the gaps at the base of the top tier, cut the smaller shapes to size and attach in place. 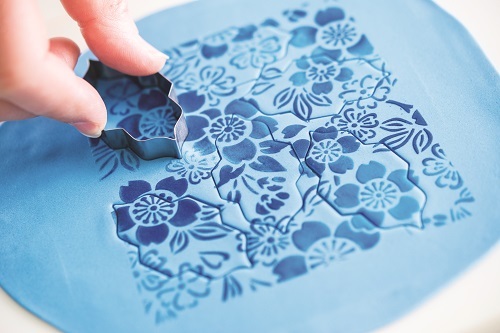 Use the same method as outlined above to create patterned tiles from both the bright blue and sky blue modelling pastes. You will need 19 tiles cut with the smaller rounded cutter from the large set for the base tier, and between 8 and 10 tiles cut with the larger, more pointed cutter from the medium set for the top tier. You will find that different stencils suit different cutters and that it is not just all-over patterned stencils that work; spot designs, such as the gem pendant below, work really well, especially when used off -centre. 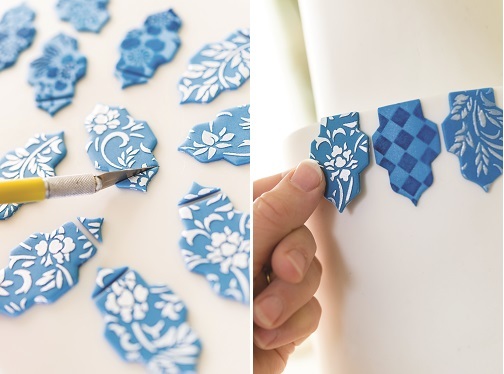 Create these tiles following the same techniques using white modelling paste, three different stencils and the blue dusts. You will need approximately eight tiles cut with the largest cutter from the large set for the base tier and five tiles cut with the largest cutter from the medium set for the top tier. When using the mini check stencil, position the cutters so that the checks become diamonds, as shown (below). 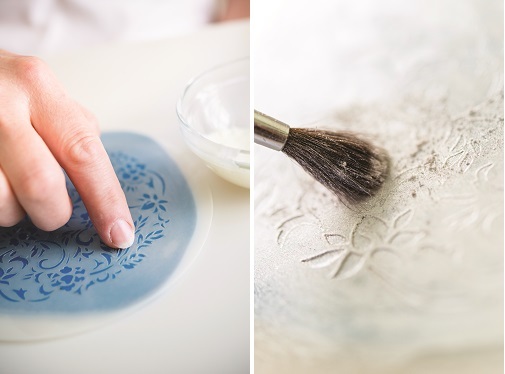 Use a selection of suitable stencils, edible lustre dust and white modelling paste to create the white-on-white patterned tiles. You will need about ten tiles using each cutter from the largest set, and three or four tiles using the largest cutter from the medium cutter set. The Greek repeat pattern stencil looks really attractive when cut out, as shown (above). 1. Add the final top row of tiles to the top tier, mixing up the colours and patterns, as shown on the finished cake. 2. For the base tier, add a mixed row of bright blue and sky blue rounded tiles beneath the first deep blue row. Below this, add a row of predominantly white-on-white tiles, interspersed with a few blue-on-white tiles. Finally, add white-on-white rounded tiles in every other space below these. 1. As this cake was covered in two sections, it is important to neaten the visible join at the top of the base tier. You will probably find that the sugarpaste around the join is not completely flat. To even this out, dilute some white sugarpaste by mixing cooled boiled water into it with a palette knife until it has a spreadable – but not sloppy – consistency. Use the palette knife to spread the icing over the join in the pastes, then smooth the icing and allow it to dry. 2. Knead the white modelling paste to warm it and roll it out between 1mm (1⁄32in) spacers into a long 60cm (23 1⁄2in) strip. 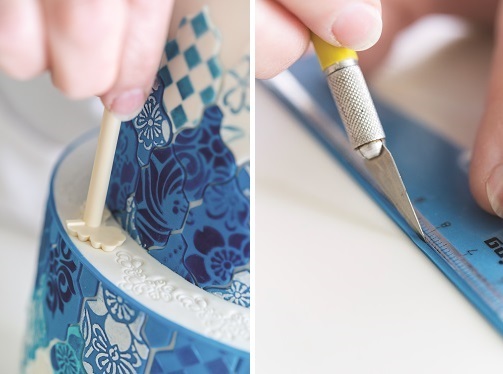 Accurately measure the distance between the top tier and the outer sugarpaste edge of the base tier and use a craft knife and straight edge to cut the strip to this width. 3. Position the modelling paste strip around the top of the base tier, cut away the excess and adjust to fit as necessary. Smooth the join closed. 4. Take the lace stick embosser and positioning it up against the top tier, press down into the modelling paste strip as shown below. (Note this step is shown on the finished cake just to illustrate the position of the embosser). Repeat until the embossed pattern encircles the top of the base tier. The embossing will alter the shape of the strip so trim it back as necessary with a craft knife. 5. Next roll out the deep blue modelling paste between the 1mm spacers into a 60cm long strip. Using a straight edge and a craft knife cut a 2mm wide strip (above). Attach this to the top edge of the base cake for a neat finish. 1. To add the carnations to the top of the base tier, first roll three balls of white sugarpaste, about 2cm (3/4in) in diameter. Add a little piping gel to the back of each flower and press one into each sugarpaste ball. Attach the balls to the cake using sugar glue. 2. At the wedding venue, place the cake on a cake stand and attach the remaining flowers in position, as shown on the finished cake. (Making edible paper flowers is the subject of a separate chapter in Simply Modern Wedding Cakes). Excerpted from Simply Modern Wedding Cakes. Copyright © 2016 by Lindy Smith and published by F+W Media, Inc. Featured by permission of the publisher. All rights reserved. Photos courtesy of Lindy & Charlotte Smith, Bang Wallop Photography. 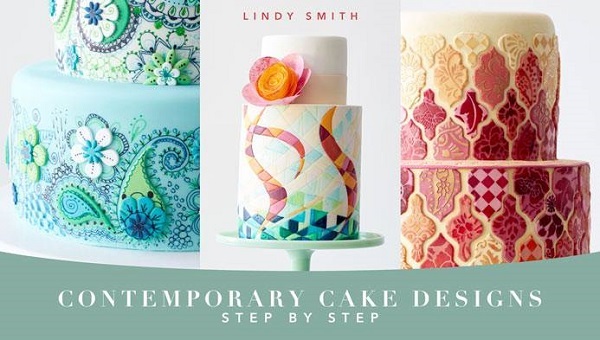 For more Lindy Smith cake tutorials online, see her new class on Craftsy here: Contemporary Cake Design with Lindy Smith.